When you work and commute 12 hours a day, five days a week, who has the time or energy to cook? For me, eating out frequently is not an option. It's too time consuming, costly and the food is not great for my figure! Since I don't get home until late, I need to bring enough food to work to last me through lunch and dinner. So how do I manage to get this done? Actually, it's pretty easy if you enjoy grilling. I like to plan my shopping and cooking on Sundays. In our household, I am the grill master and my wife is the cook. She will cook a pot of beef barley soup or chili that lasts us several days. For me, grilling food outdoors is fun. 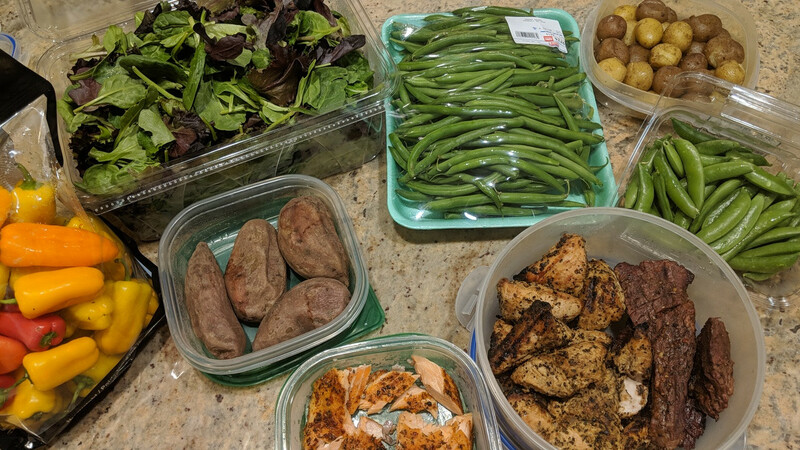 Let me share with you how I shop, prep and cook enough food to create 12 healthy meals in one afternoon. Step 1 - Write Shopping List (15 minutes). This always includes fresh vegetables and protein (fish, chicken, beef) - whatever looks good and on sale. For a quick snack I'll have nuts (almonds, cashews). Step 2 - Shop (60 minutes includes drive time) I know exactly what I need and don't get side tracked, so I'm in and out quick. 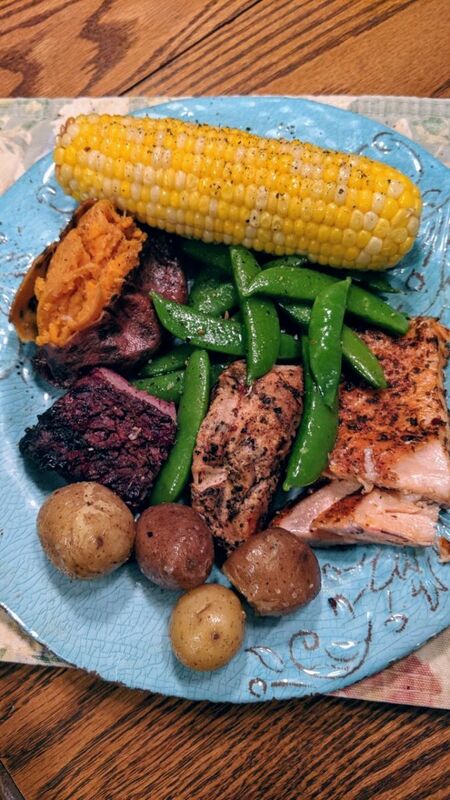 I'll buy 6 lbs of fish, chicken, beef, figuring 8 oz servings will yield 12 meals with sides. I like to buy organic mixed greens and small peppers for salads. Step 3 - Food Prep (30 minutes). I use some light seasonings, pepper and not too much salt. Tip: while the grill is cooking, this is when I cut and prep our veggies. Step 4 - Grilling (30 minutes) Everything cooks in 30 minutes or less. More time if you like it well done. Sometimes, I will marinate veggies and grill them. This takes longer. Step 5 - Microwave Veggies (15 minutes) When I'm short on time, I'll use the microwave. I'll cook green beans and snap peas in a bowl with water (not completely covering them). Add salt and pepper and cook for 2-3 minutes depending on how you like them. You can microwave 4-5 small sweet potatoes in 10 minutes. 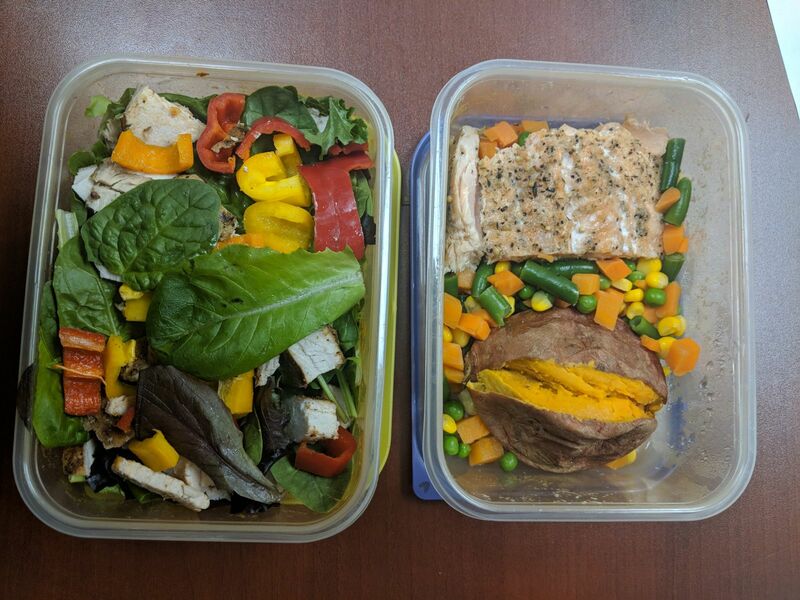 Step 6 - Mix and Match Meals for Work (15 minutes). I'll buy some food containers, add my veggies, sweet potato and meat or fish for dinner. Later on, I'll re-heat in the microwave. For lunch, I'll make salads with peppers and add my protein. For salad dressing I'll mix virgin olive oil and balsamic vinegar. Healthy and tastes good!